Before I move to some details of our next Gathering, I would like to share with those who couldn’t make it two weeks ago, some details from our last one. I would like to thank our sponsor for the next year, the Polish Investment & Trade Agency ( PAIH ) www.paih.gov.pl and the Jakarta Bureau Chief, Jacek Kołomyjec, for the presentation about their new role in Jakarta in Promoting Polish businesses in Indonesia and introducing business opportunities for Indonesian companies willing to invest in Poland. There was a lot of fun and most of our guests stayed long. Thank you all of you who joined us that night for coming. So, it is almost the end of the year and it is time for our Christmas Gathering with the number XXXXV. 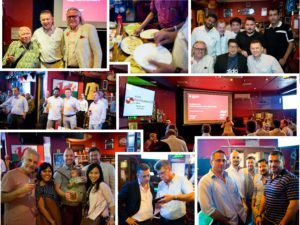 So, those of you who will be in Jakarta on the 6th of December and are interested to expand your horizons and meet your friends, please join us at the Eastern Promise Bar & Resto in Kemang http://www.epjakarta.com, where the Polish Business Club in Jakarta will hold its XXXXV Gathering. 350,000 Rp for non-members and their guests. We will provide a buffet dinner (Indian food), free flow of beer, red/white wine, soft drinks & mixers and some Polish vodka WYBOROWA and ZUBROWKA. Because we have some conditions related to the rent of the facility and services during our gatherings,please confirm, PLEASE REALLY DO CONFIRM your attendance by responding to this mail, to say that YOU ARE or that YOU ARE NOT coming (regrets are also important!